Update: This give-away is now closed. Thanks to everyone who entered and congrats to the winner. The Fat Quarter Shop are celebrating 10 years in business with 10 blocks and 10 fabrics! Quilt along with them to make an unforgettable holiday quilt, Deck-ade the Halls. 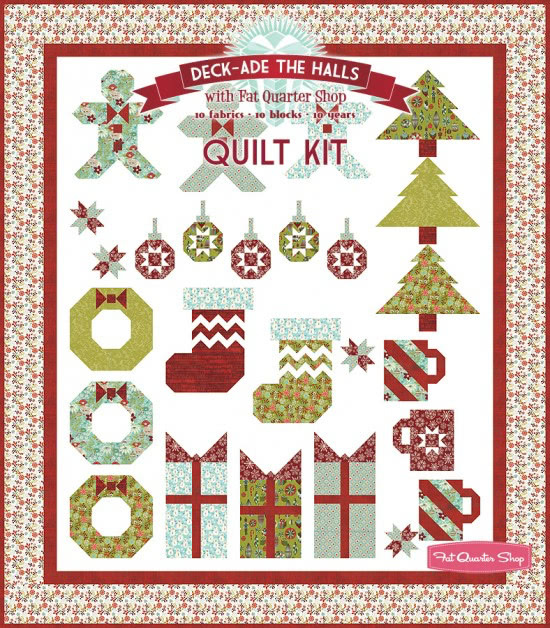 They’ve asked me to help celebrate with them by giving away not only the Deck-ade the Halls Quilt Kit to complete the top, but also the backing set, to one of my lucky readers. That’s a whopping 15 yards of fabric folks! See below on how to enter. Their quilt-along downloads include a color card, instructions for the nine sections, and end with finishing instructions to complete the quilt. They are posting a new download every two weeks from May 13th through September 16th, so you will have plenty of time to have your quilt completed by December. Everyone is welcome to enter the give-away. One comment per person please. You must provide a valid email address for me to notify you should you win. Type your email address carefully! Winner will be chosen randomly next Tuesday, June 18th, 2013. 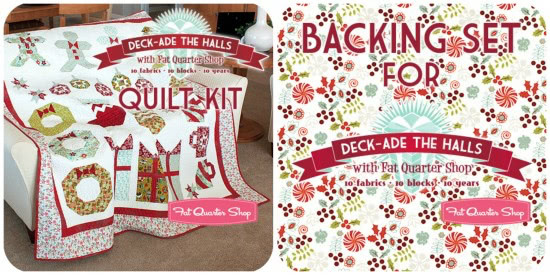 To enter the give-away, visit the Fat Quarter Shop’s Christmas Cloth Store. Browse around and let me know what your favourite Christmas fabric line is on their site by leaving a comment below. I love a Merry Little Christmas by Zoe Pearn. It brings in some new fun colors to what we normally see in a Christmas line. What a give-away! I would LOVE to win! Great give-away! I like the Warm Wishes collection best. Wonderful giveaway and I love the Aspen Frost collection! I really like the Holiday Frost fabric line. It is very classic and love the red and gray colors. My favorite is Holiday Treats by Timeless Treasures- so cute! GORGEOUS fabric even though I am having a hard time thinking about Christmas! OOO I love ALL the christmas fabrics. I’m going with Merry Little Christmas as the front runner! They are all so beautiful. I is so hard to choose just one. Thanks for the chance to win. I love Ho-Ho-Ho, Let It Snow by Nancy Halvorsen but it would be great to win Deck-Ade The Halls. Thanks for giving us this opportunity. Dana Brooks for Henry Glass Fabrics is sweet! I love the vibrant colors and clear playful designs. It would be a wonderful opportunity to create with these fabrics! I am so glad I visited the shop, I found the perfect fabric I was looking for. I am planning to make a red and white quilt, thought how easy is that but it is hard to find red and white fabric. Never thought to look at christmas fabric. Thanks. Hi, I love all of them but Merry Little Christmas is my first pick.Thanks for the huge giveaway and a chance to win. I love Kate Spain’s Inn From the Cold! The cocoa cups with the mint background I believe is my favorite from the collection!! Thanks for hosting the giveaway!! One of us is going to be very very lucky indeed!! Love the Holiday Frost line….. the reds and grays. Would love to win this!!! My favourite is “Snowy Winter Wishes” by Hoffman Fabrics. Holiday Frost has to be my favorite. Young and fun. Wintergreen is my favorite line. My kind of colors. My fabric fabrics are the Hoffman “Winter Wishes,” especially the Snowy Winter Wishes bundle. Holiday Frost by Jan Shade Beach for Henry Glass Fabrics is for me because it’s different, modern, FRESH! Holiday Frost is Soooo happy – Love it! I love Aspen Frost by Basic Grey!! Thanks for the chance to win!! I love the Aspen Frost the best!